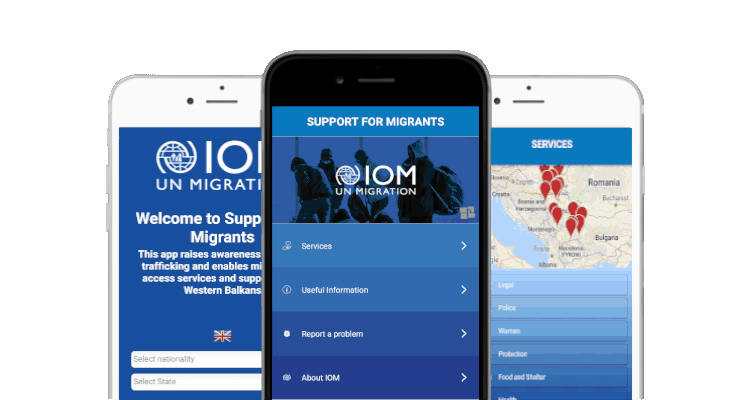 For advice on all the nearest services and support for migrants and refugees check Support For Migrants web application or download Android and iOS application. You’ve just arrived in the Western Balkans? Click here to sign up for Support For Migrants web application and find the closest places for food, shelter, legal and medical help. Where can I get food and shelter near here? Who can give me free and reliable legal advice in the Western Balkans? Where is the nearest medical help? Who can help if someone takes my documents or hurts me? Are there any organisations helping women near me? Are there any organisations helping children near here? Which trusted organisations will help me in the Western Balkans? I’ve just arrived in the Western Balkans. What should I do next? Support For Migrants is easy to use and a reliable source of information and advice for migrants and refugees. Sign up for web application or download mobile application to find out more. © 2018 All rights reserved. Support For Migrants. The Website is owned, hosted and administered by the International Organization for Migration (hereinafter referred to as "IOM"), an organization part of the UN system. 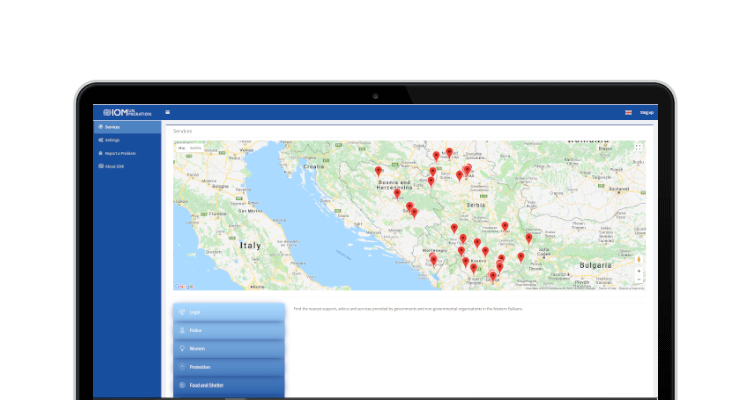 The Website provides publicly information that raises awareness of human trafficking and enables migrants to access services and support in the Western Balkans as well as the latest advice on government, UN and NGOs services wherever migrants are in the Western Balkans (hereinafter referred to as the “Materials”) including but not limited to names and contacts of available services, chapters about human trafficking, about migrants’ rights in the specific country, about IOM for informative purposes only. All Materials on the Website are subject to these General Terms and Conditions. All intellectual property rights, including copyright, relating to the Materials on the Website shall remain vested in IOM, unless otherwise stated. IOM reserves the right to assert ownership of the Materials collected on the Website. The Materials may be viewed, downloaded, and printed for non-commercial use only, without, inter alia, any right to sell, resell, redistribute or create derivative works therefrom. At all times the User shall credit IOM as the source, unless otherwise stated. The User must include the URL of the Materials from the Website, as well as the following credit line: Source: “International Organization for Migration (IOM), MONTH, YEAR”. By visiting this Website or using its Materials, the User acknowledges and agrees that the Website may contain the third-party content, which is not created and owned by IOM. The provision of the third-party content on this Website is for informational purposes only. Although IOM makes reasonable efforts to obtain reliable content from third parties, IOM does not guarantee the accuracy of, does not endorse the views or opinions given by any third-party content provider and does not guarantee that the third-party content does not infringe any other third party intellectual property rights. The third-party content provided on the Website may be the intellectual property of the third parties content providers. Permission to use such Materials, must be requested from the copyright owner. IOM name and logo are exclusively owned by IOM. The use of the IOM name and logo, including copying or reproducing in any form without written permission of IOM is prohibited. The use of the Website is at a User's sole risk. By using the Website, the User agrees to defend, indemnify and hold harmless IOM, its officers, employees, content providers, information providers and agents from and against all loss, costs, damages and expenses (including legal fees and costs), claims, suits and liabilities to the extent arising out of the use of the Website. The Materials are provided on an "as is" basis, without warranty of any kind, either express or implied, including without limitation, warranties of merchantability, fitness for a particular purpose, and non-infringement. IOM specifically does not make any warranties or representations as to the appropriateness, quality, reliability, timeliness, accuracy or completeness of the Materials on the Website. Neither IOM nor any of its officials, employees, agents, information providers or content providers shall be liable to any User or anyone else for any inaccuracy, error, omission, interruption, timeliness, incompleteness, deletion, defect, failure of performance, computer virus, communication line failure, alteration or use of any content published on the Website, regardless of cause, or for any damages resulting therefrom. The Website uses Google Maps Services for information and illustration purposes only. The depiction and use of boundaries, designations, geographic names and related data used on these maps are not warranted to be error free nor do not imply official endorsement or acceptance by the International Organization for Migration (IOM). IOM does not necessarily support policies and beliefs of organizations and individuals listed or referred to in the Materials held on the Website. Other websites may link to the Website without seeking the permission of IOM. However, such links must clearly identify IOM as the source of the information displayed and preserve the integrity of the Website without alteration. While IOM makes every effort to ensure the Materials available on this Websites are free of any software virus, it cannot guarantee that the Materials are free from any or all software viruses. IOM is not responsible for any loss or damage caused by software and related codes, including viruses and worms. The Website is best viewed with the popular browsers: Google Chrome, Firefox, Safari, Opera, Microsoft Edge. The Website is fully responsive. This means that it fits on all standard screen resolutions. Nothing in or relating to the Website shall be deemed a waiver, expressed or implied, of any of the privileges and immunities enjoyed by IOM as an intergovernmental organization. Any dispute, controversy or claim arising out of or in relation to these General Terms and Conditions, or the breach, termination or invalidity thereof, shall be settled amicably by negotiation between the Parties. The present General Terms and Conditions as well as the arbitration agreement above shall be governed by the terms of the present General Terms and Conditions and supplemented by internationally accepted general principles of law for the issues not covered by the General Terms and Conditions to the exclusion of any single national system of law that would defer the General Terms and Conditions to the laws of any given jurisdiction. Internationally accepted general principles of law shall be deemed to include the UNIDROIT Principles of International Commercial Contracts. Dispute resolution shall be pursued confidentially by both Parties. This Article survives the expiration or termination of the present General Terms and Conditions. These General Terms and Conditions are written in English language. In the event if these General Terms and Conditions are translated into another language(s), English text will prevail. IOM seeks to ensure that personal information processed through the Website is handled with the utmost care and confidentiality respecting human dignity and protecting human right to privacy. IOM monitors general trends in the use of the Website, inter alia the number of visits of the Website. IOM uses this information to generate statistics and measure the Website’s activity in order to improve its usefulness. This information is never connected with any personal information the User may supply to IOM for one of IOM's services. Nationality, gender, age, state, language to search for relevant services and information contained in the Materials of the Website, to learn about the services available, to subscribe to newsletters or to participate in the surveys. In such event, IOM will only use the personal information for the purpose for which it was disclosed. IOM will never use this information to identify a person. IOM does not sell, distribute or rent personal information collected on the Website. At any time, IOM processes personal information, it applies its Data Protection Principles. IOM relies on online service providers for the provision of services, such as website traffic analysis, online surveys etc. IOM does not intend to either solicit or collect personal information from any User under the age of 13 years. The Users under the age of 13, should not use the Website. Cookies are small text files that contain numbers and letters, which are placed on the User’s computer or other devices from which the User visits the Website. The User therefore agrees the cookies to be placed on the User’s computer or other device they are using when visiting the Website. They are widely used in order to make the Website work more efficiently, to ensure that the Website meets the User’s needs and that the Materials are tailored for the Website’s audience. Managing Cookies: Enabling and Disabling Cookies? The Website may contain embedded third-party content or plugins, which have their own cookies that may be installed on the User’s computer or other device. The Website does not govern the installation and other settings related to the third-party cookies. Therefore, it is recommended to visit the third-party websites, application or other services to learn more about their privacy policies and cookies use. IOM cannot be held liable for any direct or indirect damage or harm caused to the privacy of User’s data collected by websites, applications or other services that are not owned or governed by IOM. The User may refer to the browser settings to enable or disable all cookies or only third-party cookies. Support For Migrants has been developed within the “Enhancing Counter-Trafficking in Crisis in the Western Balkans” project funded by the U.S. Department of State’s Office to Monitor and Combat Trafficking in Persons (J/TIP). This campaign was funded by a grant from the United States Department of State. The opinions, findings and conclusions stated herein are those of the authors and do not necessarily reflect those of the United States Department of State.